Bright, fresh, garlicky, tangy, and full of that classic dill pickle flavor, these refrigerator dill pickles won’t disappoint! 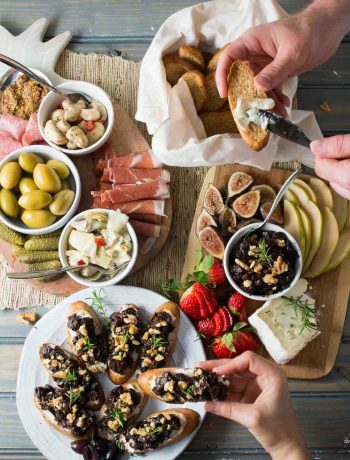 You’ll never go back to store-bought again! Okay, I don’t say Best Ever lightly. But I can’t stop eating these pickles. Seriously. I made one jar of them a week ago and they were SO GOOD I went straight back to the farmer’s market and got enough for half a dozen more jars. You know, to last me the week until the next farmer’s market. Even though I was all about the refrigerator pickled okra last summer, I had never made dill pickles before. But this year I planted some pickling cucumbers in my garden and I figured I should try making pickles with some farmer’s market cucumbers before I have cucumbers from my own garden. Since I don’t usually have a huge yield in my garden, I’m very stingy with my home-grown produce and always want to do the Best Thing Ever with whatever I grow. So a dill pickle trial run was in order. For some reason I was skeptical that they would actually taste like dill pickles. To me, fresh dill doesn’t smell or taste like dill pickles, so I didn’t think homemade ones would stack up to what I was used to. They stacked up and far surpassed! I brought the rest of the jar to work and passed them out to my coworkers like candy. One of them went straight to the farmer’s market and got her own cucumbers to pickle. They’re fresh, crunchy, tangy, garlicky, and full of that dill pickle flavor — even after only a day in the fridge. They are SO STINKIN’ EASY to make. You just throw a few ingredients in a pot, bring to a simmer, cool, and pour over your cucumbers in a jar. 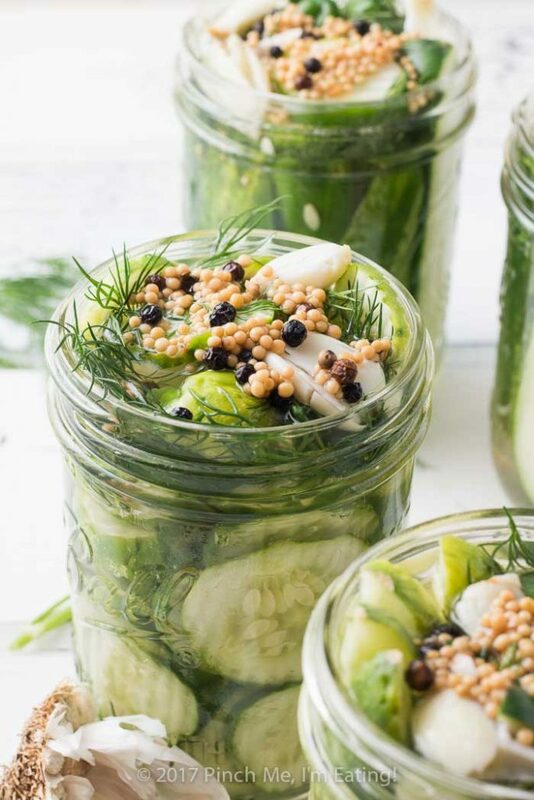 These are refrigerator pickles, so there are no canning baths and whatnot to worry about. You can make half a dozen jars of pickles in hardly more time than the time it takes to make one jar. And trust me, you’ll want to. The only real additional time is extra time spent peeling garlic and cutting your cukes. When you price it out, they are way cheaper than storebought pickles — almost half the price — especially if you’re getting cucumbers in season from a farmer’s market. More on that in a minute. Definitely worthy of using my own precious homegrowns, if I end up with any! I spent about $7 at the farmer’s market on enough cucumbers for 6 jars of pickles (18). I did shop around and avoided the one vendor selling pickling cucumbers 3 for $2.25 since the other two were selling them for $1.50 a pound and 2 for a dollar. Add maybe 50 cents worth of white vinegar (I get a biggish jug), 50 cents worth of garlic, $3 for dill… I already had mustard seeds and whole peppercorns but if you need to get some they will give you SO MANY PICKLES. Anyway, I figure it averages out to less than $2 a jar. I pay about $3.50 for storebought pickles and these are so much better!! I seriously don’t think I’ll ever go back to store-bought pickles again. Lucky for me, they only sold mason jars by the dozen at the grocery store. Because the moment I took a bite of that first pickle, I knew I had to make more. LOTS more. These wide-mouth pint-sized canning jars are the ones I used. 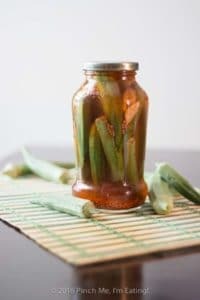 Since these are refrigerator pickles, you can use any other clean glass jar like a spaghetti sauce jar too. You may, however, run into issues of your pickles floating, or need to adjust the amount of liquid to the size of your jar. 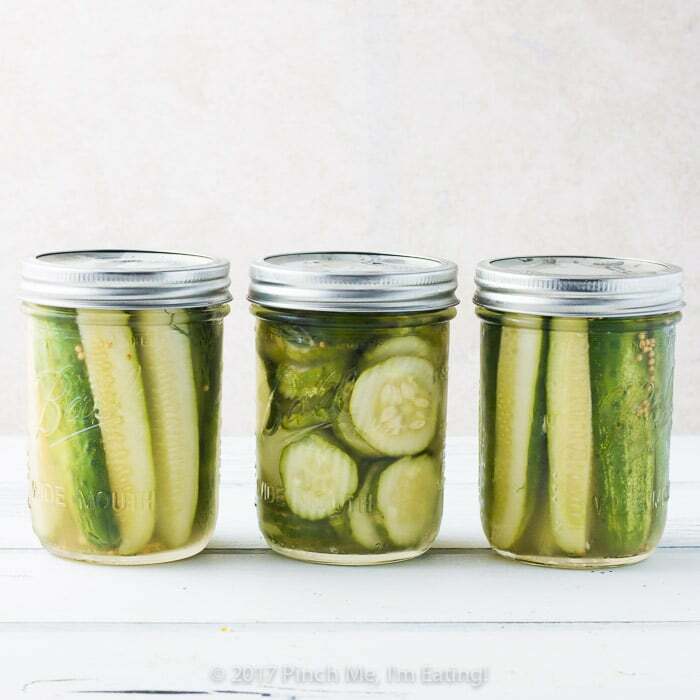 If you are using standard pint-sized canning jars, get cucumbers that are no more than 4 1/2″ long or they won’t fit! 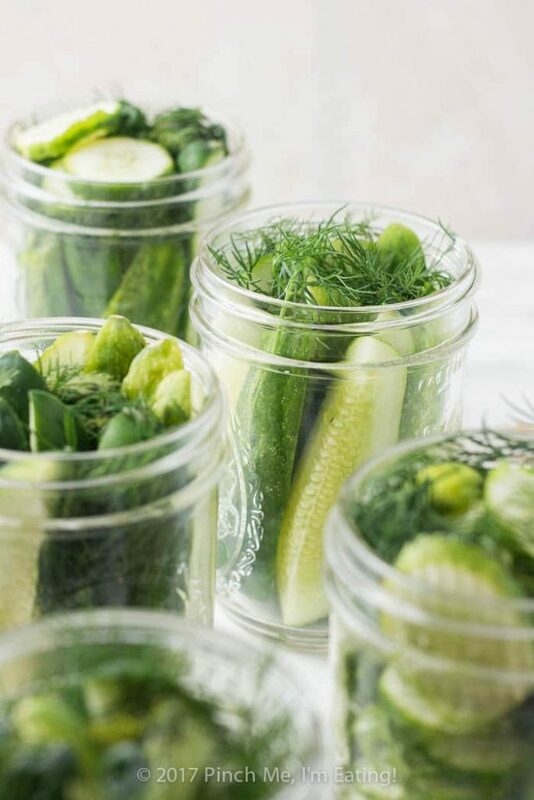 For the pint-sized wide-mouth mason jars, one jar fit exactly three cucumbers, or 12 pickle spears. I cut most of my pickles into spears but I did do one jar of crinkle cut slices for sandwiches too. Here is the mandoline I used to crinkle cut my pickle chips! A note: This recipe is for refrigerator pickles, so these are not shelf stable! You will need to keep them in the fridge until they’re gone. I read that refrigerator pickles will keep for a couple months in the fridge, if you can manage not to eat them all in a day or two! These taste great even after only 24 hours but will become more flavorful after another day or two. I have portioned the recipe to make one jar of pickles, but if you hover over the “1” where it says it makes 1 pint-sized jar, you can adjust the slider to tell you how much of everything you’ll need for however many jars you want to end up with! 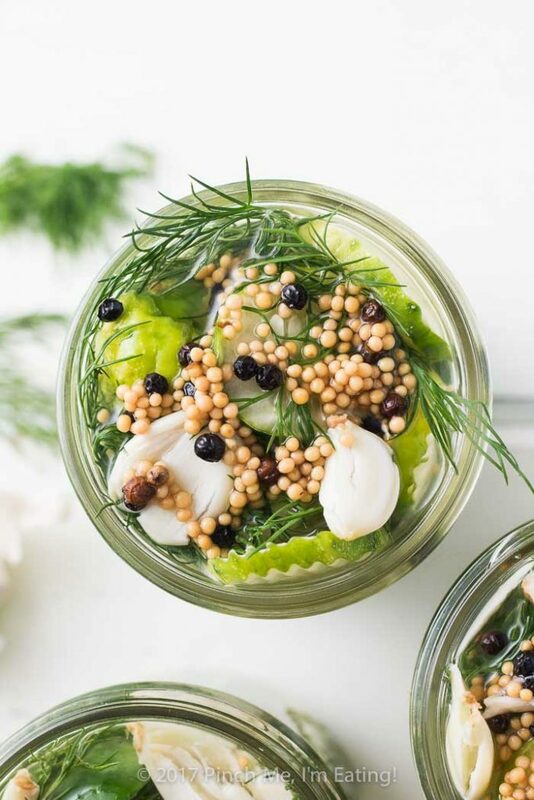 Bright, fresh, garlicky, tangy, and full of that classic dill pickle flavor, these refrigerator dill pickles won't disappoint! 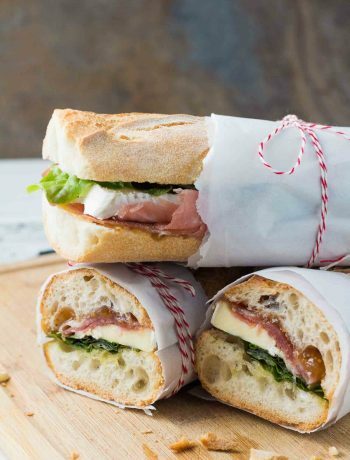 You'll never go back to store-bought again! Wash cucumbers and cut into spears or slices. Pack into a wide-mouth pint-sized canning jar, or any clean glass jar. 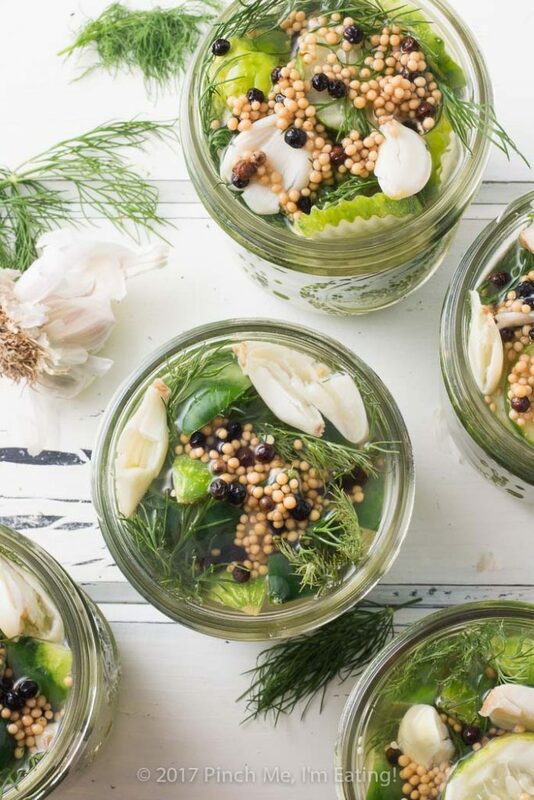 Since these are refrigerator pickles a canning jar is not necessary. Tuck several sprigs of dill in between the cucumbers. In a saucepan, combine the vinegar, water, garlic cloves, salt, sugar, mustard seeds, and peppercorns. Bring to a boil and stir until the salt and sugar are dissolved. Remove from heat and cool to room temperature. Pour liquid over cucumbers in the jar. Make sure to include all the mustard seeds, peppercorns, and garlic. (If making multiple jars, include two cloves of garlic per jar and divide the mustard seeds and peppercorns approximately evenly between jars.) If you are using a slightly larger jar and the liquid doesn't fully cover the pickles, fill the rest of the jar up with water. Close the jar and refrigerate for a minimum of 24 hours but preferably 48 hours. Enjoy! To make more than one jar, adjust the slider at the top of the recipe to however many jars you'd like to end up with! To quickly cut even slices of cucumbers (straight or crinkle cut), you can use a mandoline like this one. You can also use a crinkle cut knife. These are not shelf-stable, so they will need to be kept in the refrigerator. They should keep in the refrigerator for about two months, if you don't eat them all before that! Saw this today and couldn’t wait. Went to the farmer’s market, bought what I needed and now I’m just waiting until tomorrow so I can try them! I just made my first batch of pickles. They are so so soooo good; crisp, tangy, and satisfying with every crunch. I can’t wait to experiment more with flavors and seasonings in future batches. Thank you so much for this recipe! I’m so glad you like them! I think I need to make a big batch pretty soon! That’s awesome! I have made one jar of pickled okra so far this year and already polished off four jars of these dills! Trust me, you’ll want to make these in bulk! These not only sound amazing, they look INCREDIBLE. You’ve done a fantastic job here. I love making pickles, but I have yet to make dill pickles because, frankly, I’ve always found dill a little overwhelming. That being said, even I’m tempted by these bad boys. I wonder if adding a little dill seed would work (either in addition to or in place of the dill fronds)? Regardless, you’ve got a real winner here – the kind that gets people totally hooked on preserving! Thanks so much, Sean! I’m not sure how dill seed would compare quantity- and flavor-wise. I’m sure it would add to the flavor but I wouldn’t get rid of the fresh dill fronds! If you have some available with the rest of the fresh herbs in the grocery store just pinch off a few little stems and tuck them between the pickles. It’s so easy and it really infuses the flavor! Love this recipe. I never made homemade pickles before and this was the best recipe to try for the first time. My husband had never had homemade pickles before. When he tried these, he ate all of them. Lol, I was lucky to get one. He LOVED these i will be making more. Thanks for this recipe. Hahah the first time I made these they were gone wayyyy too fast! I learned my lesson and made about half a dozen jars the next couple times! So glad y’all enjoyed them! Hi Greg! Yes, the recipe is per jar. There is a slider but it’s only visible when you hover over the “1” in the part of the recipe card where it says “Servings: 1 pint-sized jar (12 spears)”. On mobile you have to click the “1” and then the slider will appear. If you still can’t get it to appear, just multiply everything by the number of jars you’re doing (and please let me know so I can troubleshoot the slider issue!) Hope this helps! These are so simple and delicious! Thank you! EASY EASY, tasty, crisp! I used different cucumbers and they all turned out great! Thank you! I’m so glad!! Thanks for sharing! Amazing!! I made these with my home grown boston pickling cukes and cukamelons. I grow a ton of dill and boiled the stems in the brine. I gave a friend a quart sized jar and 24 hours later his wife, daughter, and himself killed it off. I will never buy store bought pickles again! I may try adding some lemon zest next time. I’m so happy to hear you and your friends loved this recipe! I think just about anything could be improved with a little lemon, let me know how it goes!! Great idea! Red pepper flakes would be good too! How would I adjust these to make quart size jars? Just scale it up x2 – if you click on the recipe card where it says it makes 1 jar, click the 1 and a slider will appear, and you can adjust it to 2. That should give you the amounts you need for one quart-sized jar! if using pickling salt would you use the same amount ? If I am using quart jars… how will the recipe change measuring wise? Hi Jamie, since a pint is 2 cups and a quart is 4 cups, you would just double the recipe and that should work. So, if you are making two quart-sized jars of pickles, you can just adjust the slider to say 4 and it should give you the correct amounts. If there is any space at the top of your jar where pickles aren’t covered yet, you can just add enough extra water to cover them. Hi Caroline. 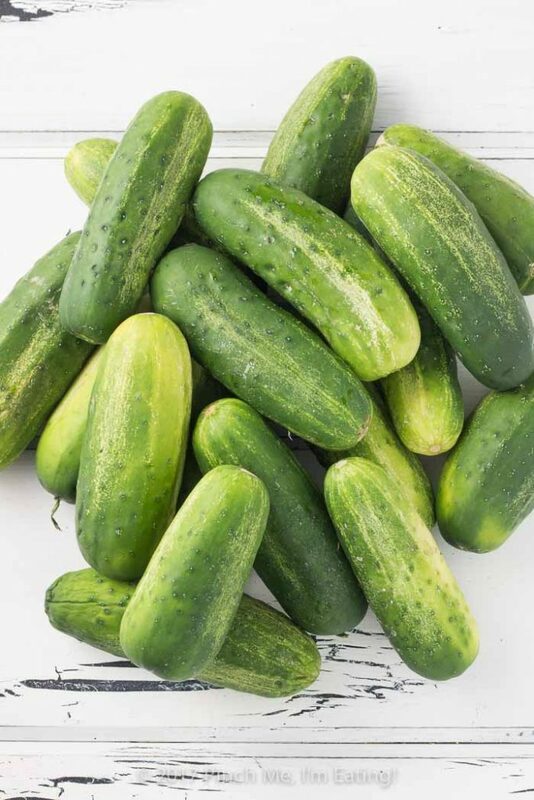 I quadrupled the recipe per 1/2 gallon Ball jar, use 6 cukes per jar and cut them into beefy 1/2″ slices. They come out great! My question is this: Reuse of the brine. Today I tried reusing the brine, cut up 6 more cukes and stuffed them in. I didn’t have any extra headroom to add any more vinegar (I figure that’s what’ll get used up). It was a toss-up to drain off a little brine and add more vinegar or not. I didn’t this time. Any thoughts? I tried reusing the brine in one of my test batches and it didn’t come out very well. I feel like the first batch of pickles sucked up a lot of the vinegar flavor in the brine and replaced it with the water from the cukes. I would definitely add more vinegar if attempting to reuse the brine. How did yours go?